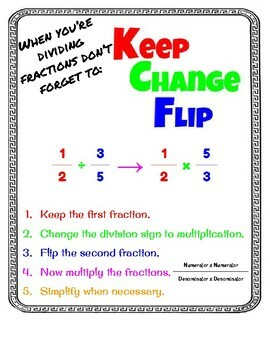 Teaching your students to divide fractions? 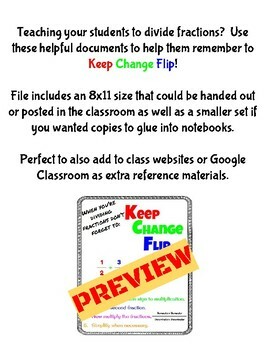 Use these helpful documents to help them remember to Keep Change Flip! 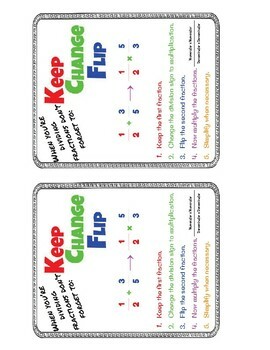 File includes an 8x11 size that could be handed out or posted in the classroom as well as a smaller set if you wanted copies to glue into notebooks. Perfect to also add to class websites or Google Classroom as extra reference materials. Possible uses include: Poster, Anchor Chart, Notebook Reference, Bulletin Board, Handout, Interactive Notebooks, Printables, etc.